Jyothisharatnam magazine 2014 July 1 – 15 issue is now in stands. Being one of the top Astrological fortnightly in India, the highlights of current issue of Jyothisharatnam are reports on Vasthu, Porutham, Grahanila and Astrology. Interviews and pilgrim report to main temples with excellent photos and illustrations are other attraction of this issue. Jyothisharatnam magazine, one of the top Astrological fortnightly in India has published the July 1 – 15 issue. 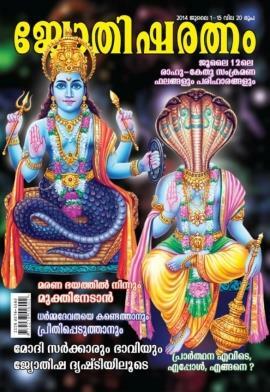 The highlights of current issue of Jyothisharatnam are reports on Vasthu, Porutham, Grahanila and Astrology. Interviews and pilgrim report to main temples with excellent photos and illustrations are other attraction of this issue. Readers can use the current edition to get the best result. Jyothisharatnam which has already become a well-liked magazine for its quality is read by people who have high interest in knowing Vasthu, Porutham and Grahanila. Interviews with famous astrologers with excellent illustrations and photography would give an insight to the readers about their various problems. Pilgrim reports on religious places will provide more information to the believers. Jyothisharatnam which has captured the hearts of the Malayali families is widely popular among Malayalees all over the world. The other features include articles on spiritualism, religion, astrology, God and Goddess which will help people to understand about the religions. As many people keep high faith on god, they wish to read enlightening articles which are directly connected with spirituality. Ganesh Mantras and Nakshtraphalam by eminent persons from Astrological field have supported the life of many readers. As this magazine is being written by professional astrologers and astrology students, the reading community uses this as a better opportunity to know more about astrology. Scholarly articles on different aspects of astrology and writing of Vedic astrologers have shed light into the heart of many believers who had kept their minds open to receive information they needed. Through this single window, one can get a lot of readable material about Astrology. As readers can get advice and answers to their doubts, it can bring purity in their lives too. Jyothisharatnam which comes at an affordable price can fit the bill. This magazine is recommended to those people who wish to keep their mind close to god and have refreshing moments in life.